NBC’s 2016-2017 midseason lineup will include two new comedies, a comic book-inspired series, a Blacklist spin-off, and a new addition to the Chicago franchise. The network will be premiering the new comedies Trial & Error and Great News as part of the Tuesday night comedy block following The Voice. Powerless starring Vanessa Hudgens, Alan Tudyk, and Danny Pudi and based on characters from DC Comics will air on Thursdays after Superstore. NBC’s popular dramatic series The Blacklist has spawned a spinoff titled The Blacklist: Redemption that will take over The Blacklist‘s Thursday at 10pm timeslot in late February 2017. Chicago Justice joins the network’s lineup on Sunday, March 5th, hoping to score ratings success like its predecessors Chicago Fire, Chicago P.D., and Chicago Med. POWERLESS — Thursday, Feb. 2 at 8:30 p.m. In a world where humanity must cope with the collateral damage of Super Heroes and Super-Villains, Emily Locke (Vanessa Hudgens) begins her first day as Director of Research & Development for Wayne Security, a subsidiary of Wayne Enterprises that specializes in products that make defenseless bystanders feel a little safer. Full of confidence and big ideas, Emily quickly learns that her expectations far exceed those of her new boss (Alan Tudyk) and officemates, so it will be up to her to lead the team toward their full potential and the realization that you don’t need superpowers to be a hero. Danny Pudi, Christina Kirk and Ron Funches also star. THE BLACKLIST: REDEMPTION — Thursday, Feb. 23 at 10 p.m. In this thrilling new spinoff, the world’s most elusive criminals from Red’s infamous list come together to form an elite mercenary team as they try to regain their self-worth after a lifetime of inflicting damage on the world. Seeking redemption for their past transgressions, this new group solves problems governments don’t dare touch. Blacklist undercover operative Tom Keen (Ryan Eggold) joins the team’s brilliant and cunning chief, Susan “Scottie” Hargrave (Famke Janssen), as well as lethal assassin and Tom nemesis Matias Solomon (Edi Gathegi), as they aim to be a force for good and right dangerous wrongs. Along with highly skilled members Nez Rowan (Tawny Cypress) and hacker Dumont (Adrian Martinez), they will undertake seemingly impossible missions — all in the hopes of repairing their damaged souls. LITTLE BIG SHOTS — Sunday, March 5 at 8 p.m.
Little Big Shots, which showcases the world’s most extraordinarily fun and talented kids, features two of the biggest names in comedy — executive producers Ellen DeGeneres and Steve Harvey. Harvey hosts the family-friendly series that celebrates phenomenal kids and goes toe to toe with them in hilarious conversations and interviews. Ranging from pint-sized dancers and amazing athletes to gifted singers and musicians, these engaging young performers will charm and delight viewers. This is not a competition but a funny feel-good show that celebrates the uniqueness of children. Gifted young performers from around the globe will awe the nation with their talents in this addictively fun series that families can watch and enjoy together. CHICAGO JUSTICE — Sunday, March 5 at 9 p.m.
At the center of the show is prosecutor Peter Stone (Philip Winchester), the ambitious Deputy Chief of the Special Prosecutions Bureau. Relentless in his quest for justice, it’s more than a job, it’s a purpose. Son of renowned New York City District Attorney Ben Stone, Stone is shooting at a target that only he can see. This often puts him in direct conflict with Mark Jefferies (Carl Weathers), the Cook County State’s Attorney who sees the world through a political prism. While Jefferies believes that a good prosecutor gives the jury and the public a clear, clean and digestible narrative, Stone is convinced the law isn’t always best served in a sound bite. Together with their team, Stone and Jefferies strive to bring some much-needed justice to the city of Chicago. The team also includes Assistant State’s Attorney Anna Valdez (Monica Barbaro), a passionate newcomer, who’s more flexible and willing to bend the rules to get the right result; Laura Nagel (Joelle Carter), a tough-as-nails State’s Attorney Investigator that sees each case through the eyes of the victim; and Antonio Dawson (Jon Seda), a level-headed and by-the-book detective turned Chief Investigator. SHADES OF BLUE — Sunday, March 5 at 10 p.m.
Harlee navigates her fractured relationship with Wozniak, as she struggles to conceal her deepest secret: she killed her daughter’s father. Following his discovery that Harlee collaborated with the FBI, Wozniak is confronted with a gut-wrenching dilemma of his own. The crew is under tight scrutiny from Stahl (Warren Kole) and the FBI as well as from Internal Affairs, in the form of a gregarious detective, Verco (guest star Dov Davidoff), who investigates the disappearance of one of their own. Meanwhile, a former member of their crew, Julia Ayres (guest star Anna Gunn), runs for mayor and her complex relationship with Harlee and Wozniak comes to the fore. Neither Harlee nor Wozniak anticipates that Ayres’ corrupt connections will trap them in a dangerous war with the Mafia. The cast includes Drea de Matteo, Dayo Okeniyi, Vincent Laresca, Hampton Fluker, Sarah Jeffery and Gino Anthony Pesi. TRIAL & ERROR — Tuesday, March 7 at 9:30 p.m. and each Tuesday at 9 and 9:30 p.m. In the spirit of true crime documentaries, this outrageous fish-out-of-water comedy features bright-eyed New York lawyer Josh Segal (Nicholas D’Agosto), who heads to a tiny Southern town for his first big case. His mission? To defend an eccentric “rollercizing” poetry professor (John Lithgow) accused of the bizarre murder of his beloved wife. Settling into his makeshift office behind a taxidermy shop and meeting his quirky team of local misfits, Josh suspects that winning his first big case will not be easy, especially when his client is always making himself look guilty. The cast also includes Jayma Mays, Sherri Shepherd, Steven Boyer and Krysta Rodriguez. GREAT NEWS — Tuesday, April 25 at 9 and 9:30 p.m.
Getting along with office colleagues can be rough, but working with your mom? 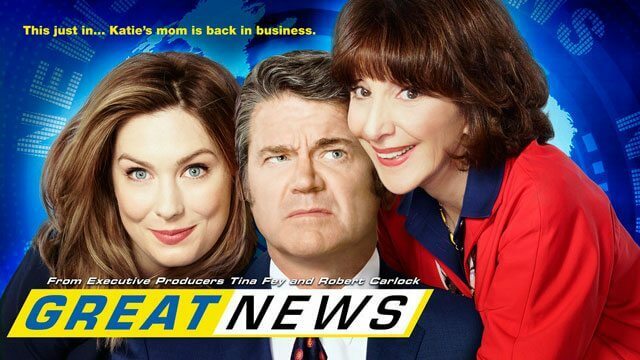 That’s a whole different story, and it’s the headline for Katie Wendelson (Briga Heelan), a smart, ambitious news producer at national cable news show “The Breakdown.” After 30 years of being a stay-at-home mom, Carol (Andrea Martin) decides that it’s never too late to follow your dreams and lands an internship at her daughter’s news show. This is Katie’s worst nightmare, until she comes to realize that with her biggest cheerleader at her side, she and her mom both might just make it after all. Sitting in the co-anchor chair at “The Breakdown” is Chuck Pierce (John Michael Higgins), the blowhard, difficult-to-please news desk veteran. Chuck intimidates everyone on staff except for Carol, who uses her polished mom skills to deal with him. Alongside him is Portia (Nicole Richie), the young, very hip co-host who brings a different perspective to old-fashioned journalism. Leading the news team is Greg (Adam Campbell), the dashing young executive producer. Katie’s closest friend at the office is Justin (Horatio Sanz), the laid back video editor who has seen it all and is always more than happy to dole out his zen-like advice. Rounding out the newsroom is Beth (Tracey Wigfield), the creepy resident meteorologist who is far from your stereotypical weather girl.